Here are some additional photos from the same day. All of the single-exposure photos were with my Canon 40D & 24-70mm L taken in RAW at ISO 100 with a very small aperture of f/22.0 using a tripod. So what piece is missing? The exposure time was set for 20 seconds! How is that possible? I used a very special filter … Hoya’s ND400 filter. 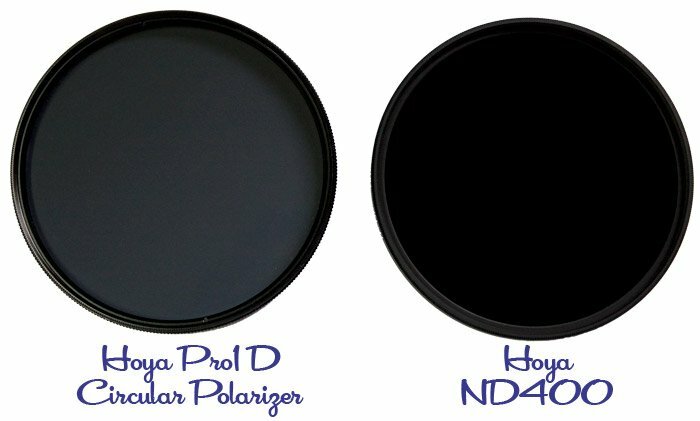 The above image shows the Hoya ND400 next to Hoya’s very dark Pro1 D Circular Polarizer. The ND400 is virtually black and provides a 9-stop decrease in light entering the lens. It is an extreme neutral density filter. All stationary items in the shot will be captured sharp and crisp. Things that move (like people) will come out as blurs or transparent. The shot becomes more believable when there are stationary people either just sitting or standing. A museum is great for this effect because you can always find people standing around reading descriptions posted next to a sculpture or painting. Everyone else becomes a ghostly blur. Since it is so dark, the ND400 can make it difficult to compose and focus the shot. Simply set-up the camera and focus before you put the filter on. The camera will still be able to auto-focus, but you will not be able to tell what it has locked on to. Experiment with the camera settings and take plenty of shots. Be sure to capture the images in RAW. Don’t worry if the images look too dark. As long as you are capturing good detail, you can always change the exposure in Photoshop using Camera Raw. 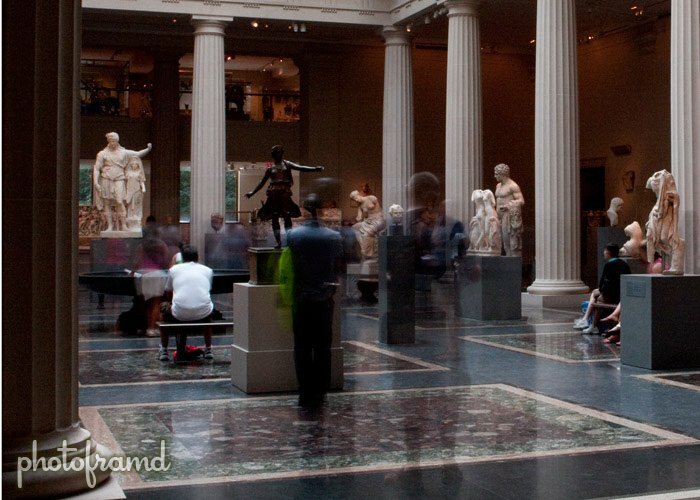 So are there ghosts at the Met? 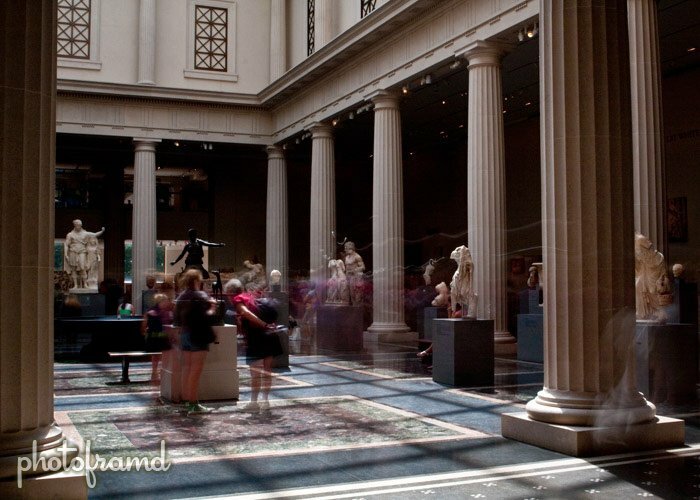 You would think that a place as large as the Met filled with so many historic pieces would have ghosts. I could find only one reference pointing to one … this article on the Anti-Tourist. It claims that there is the ghost of a little girl wandering the halls of a section in the American Gallery. As of August 2009, the section as depicted in the picture no longer exists. It was an area in the Luce Gallery that leads to the new glass elevator. All of the paintings and furniture in this area have been removed as part of the recent renovation. I spoke to several of the guards in the American Gallery about the ghost and I even showed them the webpage on the Anti-Tourist on my Pre to confirm the location. None of the guards knew of the ghost. But, they did say that it would be the night crew who would might have ghostly experiences. At night, all of the main lights are turned off leaving only the security lights on. The guards walk their rounds with flashlights in this almost pitch-black. I could see this being very spooky. The guards did talk about two very creepy areas. There is the Blue Bed in the Aitken Gallery (the European Gallery) and the Red Bed in the top floor of the American Gallery. 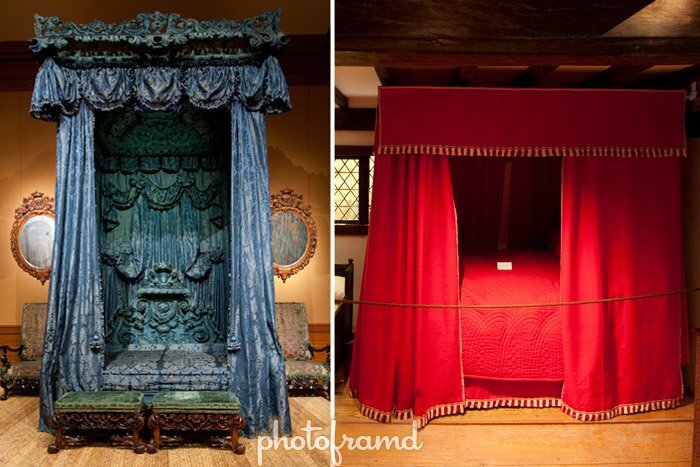 Both of these beds are covered in heavy velvet and imply a coffin. Did I see anything?? No, but I also did not find the beds to be that creepy. However, while I was standing at the Blue Bed, almost every woman who came up mumbled, “creepy”. I even attempted the Ghost Hunter thing with a group of women … “Is there anyone here who would like to talk to us?” Nothing but laughs from the group. Maybe next time, the ghosts will come out to play.